The first time I opened Heritage by chef Sean Brock, it fell open to a page titled How to Build a Pit and Cook a Whole Pig like a Champion Pitmaster. Funny this should happen to me, considering I’m vegetarian. Heritage is deeply nostalgic, an ode to the food and ingredients of the South, equal parts memoir and cookbook. Many of the recipes are complex, as chef recipes can be. In the end, I decided to tackle his sweet potato doughnuts. I made it four times, gradually increasing the percentage of whole wheat flour each time. Using sprouted whole wheat helped, as it has a softer texture. My final take on this recipe is 100% whole grain and baked instead of deep fried. 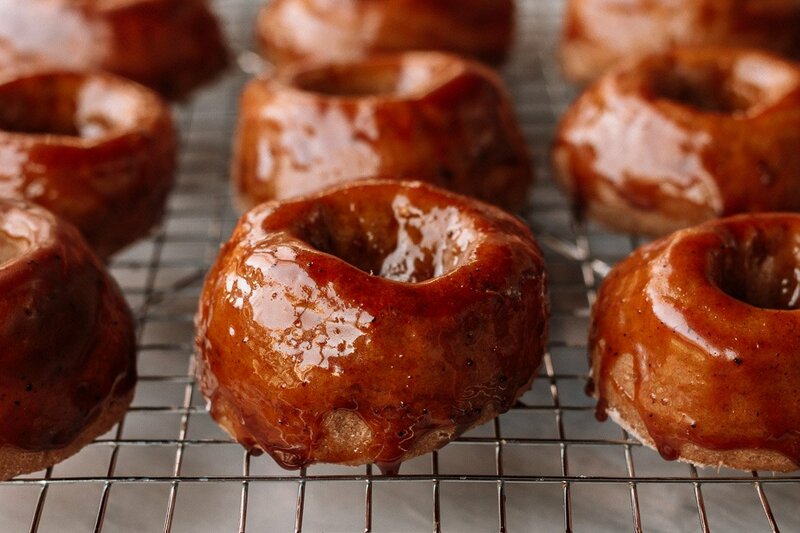 Brock gives an accompanying recipe for a bourbon caramel glaze, which I did not make. You’ll just have to get the book if you want that recipe. I glazed my doughnuts with a jar of ready made kona coffee caramel. They would also be very good brushed with melted butter and dipped in cinnamon sugar. Preheat the oven to 375°F. Place the sweet potatoes on a baking pan and cover tightly with foil. Bake for 45 minutes, or until tender. Let cool. Cut the sweet potatoes open, scoop the flesh into a food processor, and discard the skins. Process until smooth. Scoop out 1 cup of puree. Combine the milk, 1/2 cup of the canola oil, and the sugar in a pot and bring to a vigorous simmer over medium-high heat. Remove from heat and cool for 30 minutes. Add the yeast to the milk mixture, stirring to dissolve. Transfer to your mixing bowl. Add the beaten eggs and 1 cup of sweet potato puree. Stir in 4 and 1/2 cups whole wheat flour and mix well. Cover the bowl, place it in a warm place (on top of the fridge works well), and let the dough rise for 1 hour, or until it has doubled in size. Combine the remaining cup of flour with the salt, baking powder, baking soda, cinnamon, ginger, and cloves. Punch down the dough and knead the flour mixture into it, mixing well. The dough will be loose. Turn the dough out onto a heavily floured surface and knead it for a minute or just until it is smooth. Roll the dough out into a 1/2 inch rectangle. Using a 3 and 1/4 inch round cookie cutter (or a biscuit cutter in my case) dipped in flour, cut out the doughnuts. Using a 1 and 1/4 inch round cutter dipped in flour, cut holes from the center of the doughnuts. Transfer to parchment lined cookie sheets (preferably the airbake ones), placing far enough apart for further rising. Pat the scraps of dough together and cut out more doughnuts and holes. Spray the doughnuts with canola oil and cover with plastic wrap. Let rise for 30 minutes. Preheat oven to 375°F. Bake for 8 minutes. Cool for a minute or two, then glaze with caramel or brush with melted butter and dip in cinnamon sugar.